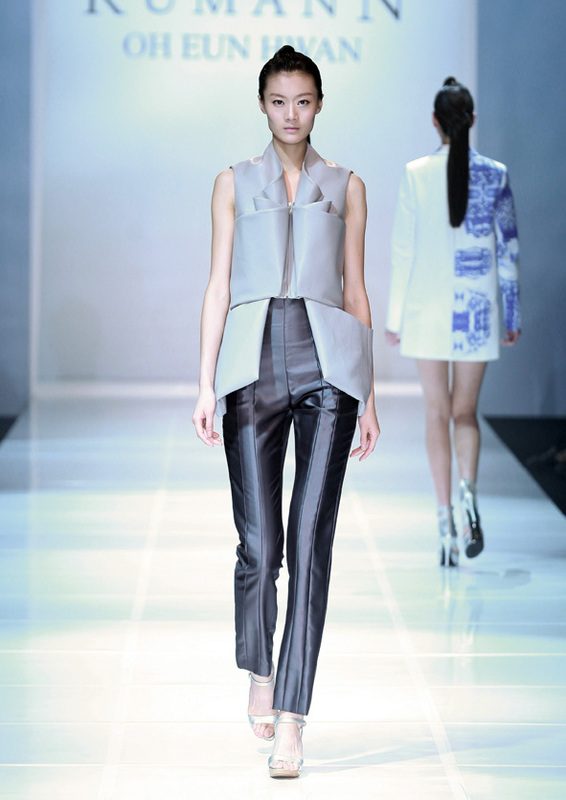 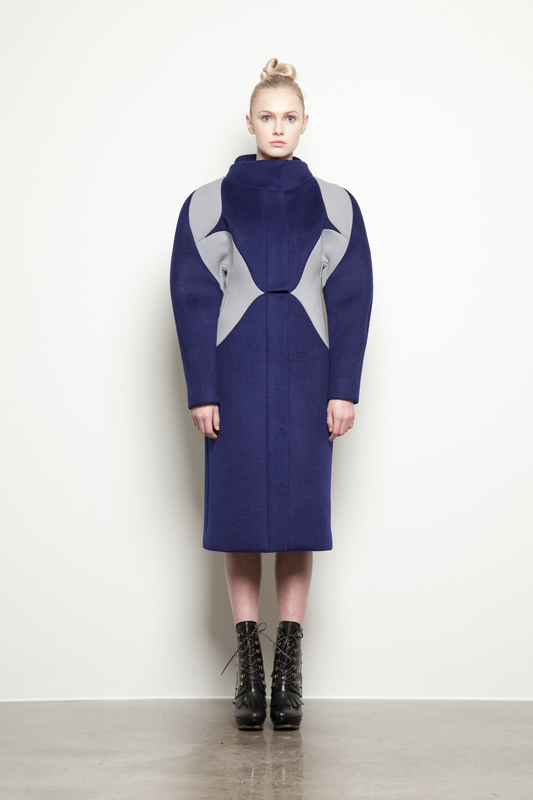 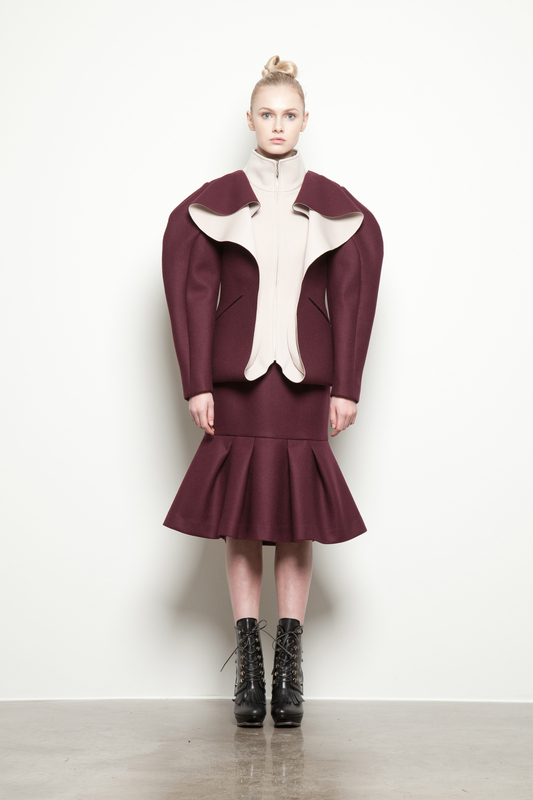 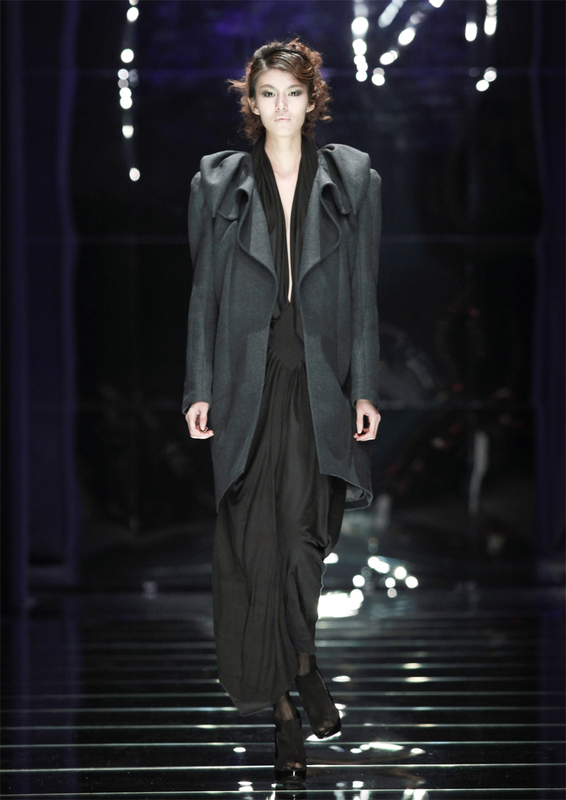 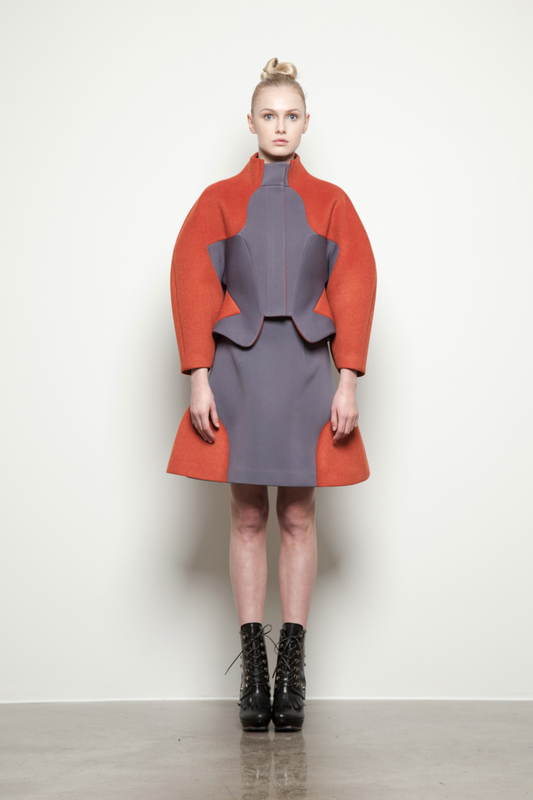 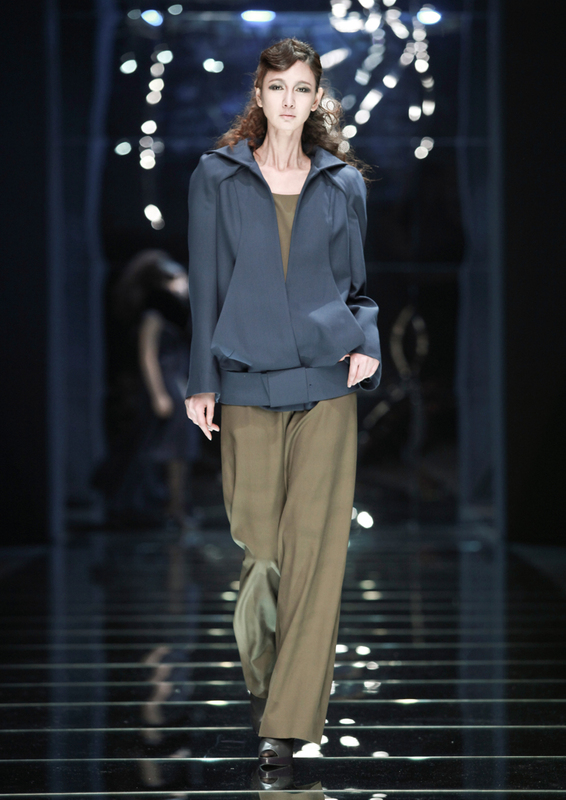 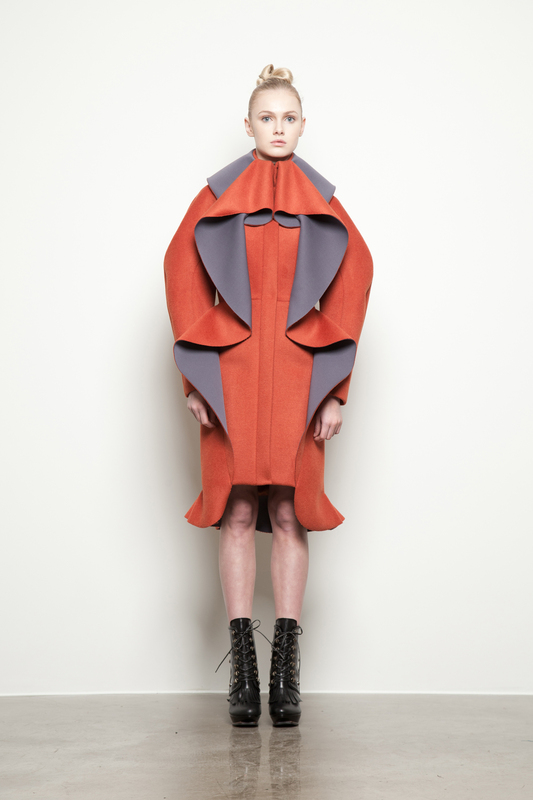 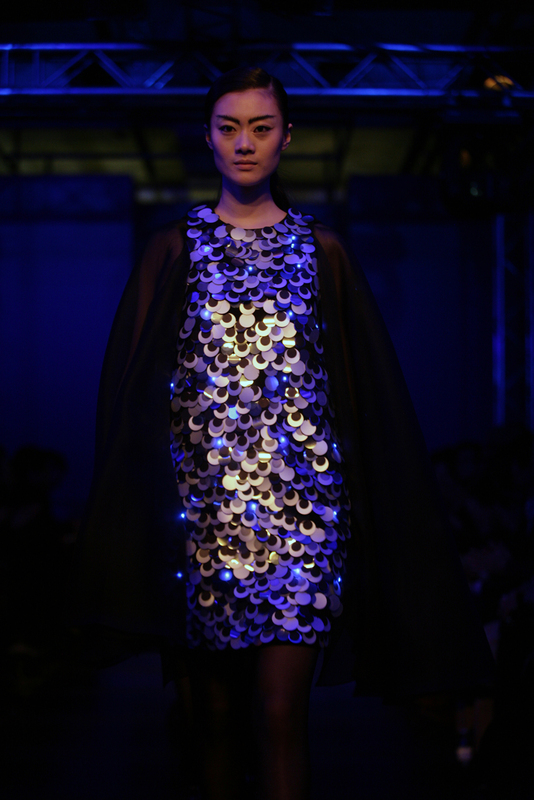 The futuristic fragments that people might have imagined in the past are the inspirations of this season. 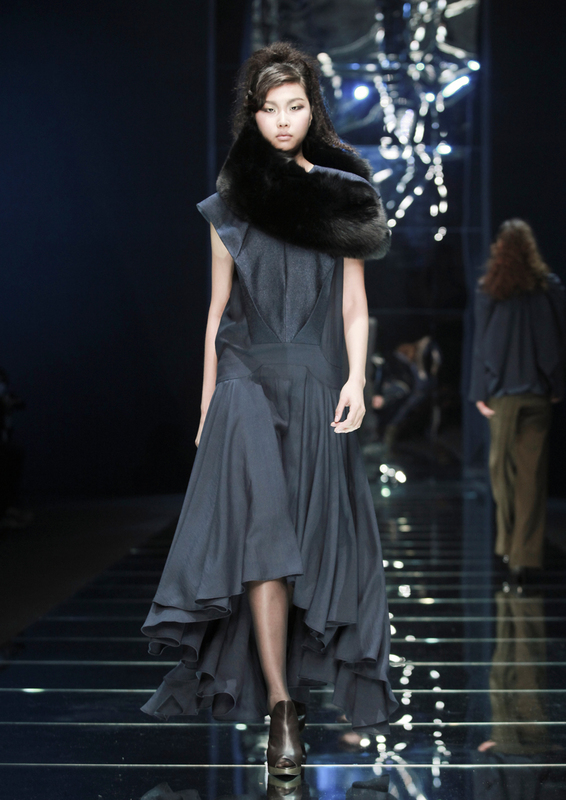 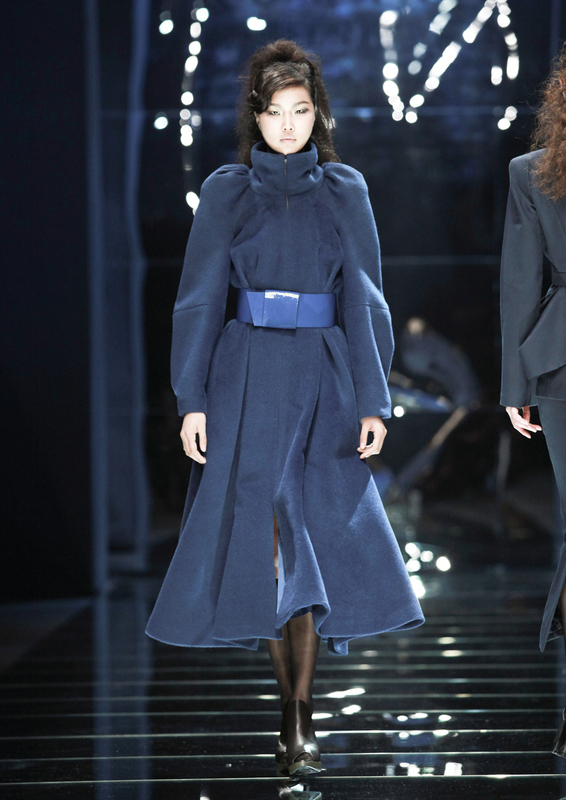 Yoo HyeJin focused on the theme by amplifying sculptural shapes of voluminous sleeves with drop-shoulder, wavy seam lines reminding new futuristic Art-Nouveau-ish cuts. 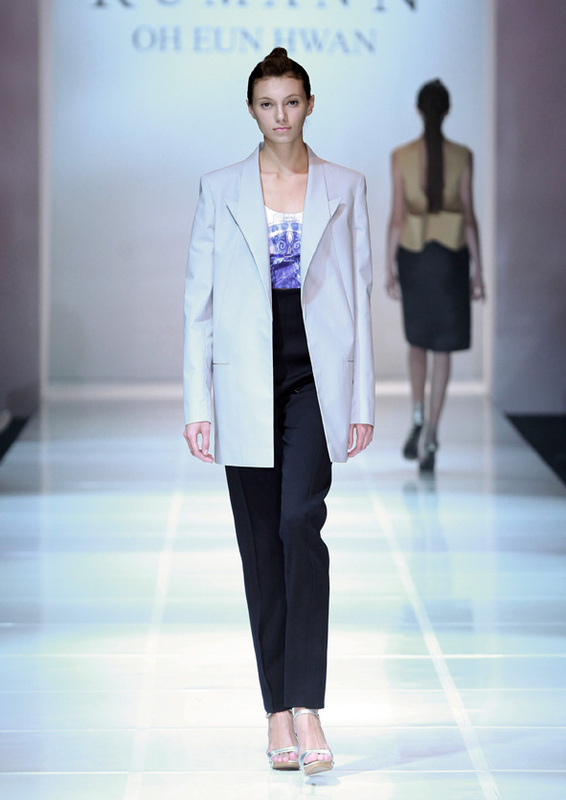 Aviator and Space look-inspired pieces with padded coats, printed with digital images of white hairy plants called Tradescantia sillamontana will be presented. 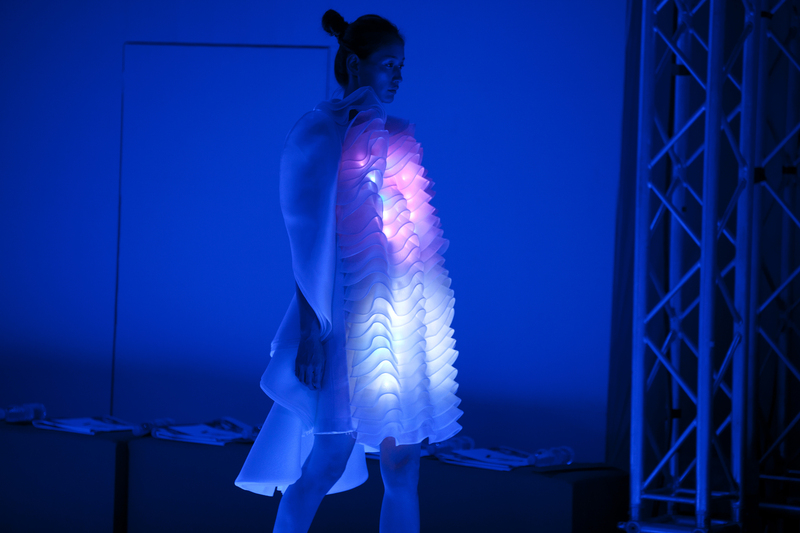 It could be a series of nostalgic future figures someone dreamt one time in the past, yet in a modern sci-fi feel. 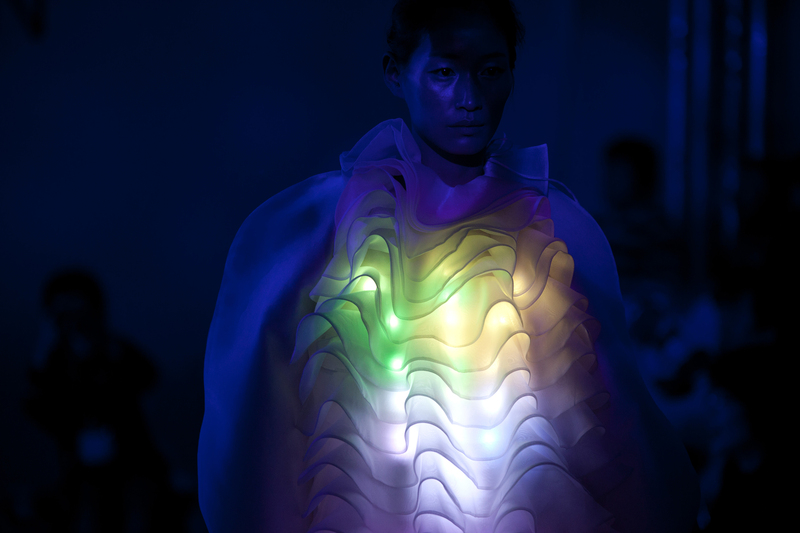 Queerness of sensitivity provoked by conflicts between reason and unreason, dubious future, ambiguous phenomena, and unexplainable feelings like fear or hope irritated by uncertainty are the inspirations of the season for designer HyeJin Yoo. 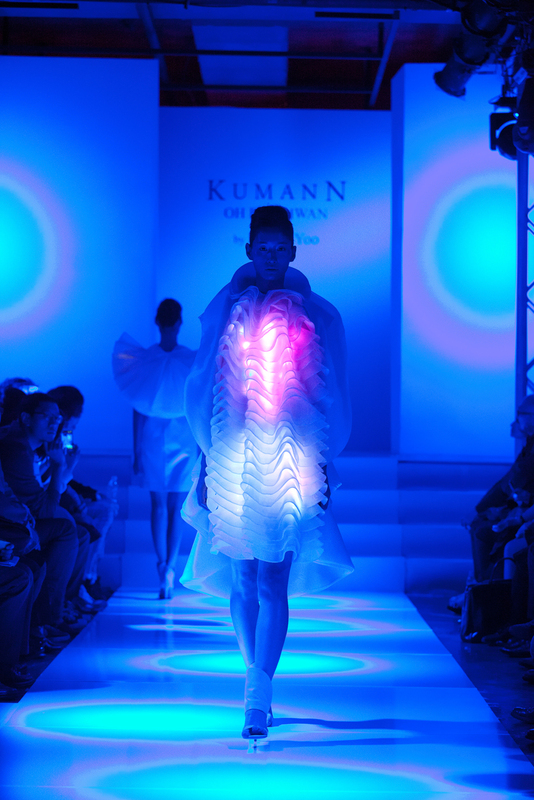 Especially, Natural forms of energy like refractions of light, wave form of sound inspired her to work on the theme of ‘Urban Shamanist.’ She also brings her digital print work which has 3d effects, ‘Shamanist Cube.’ 3d glasses (pink and green) can make it more enjoyable. 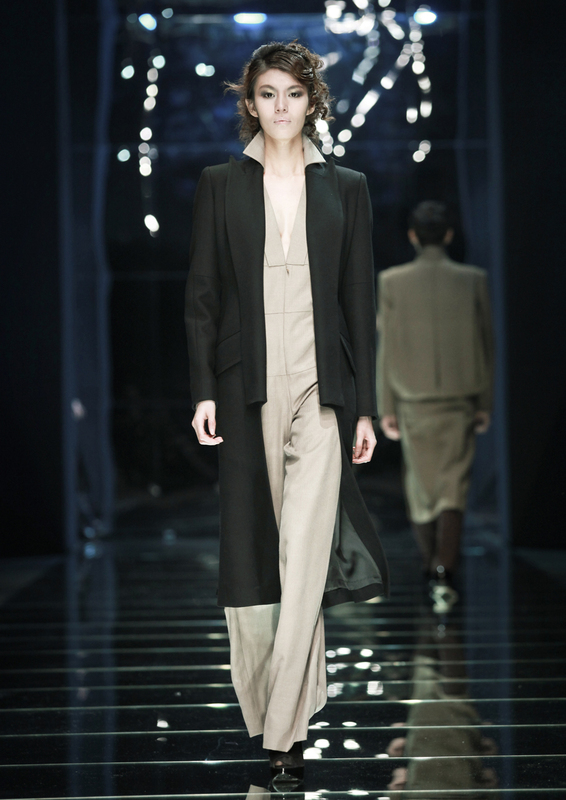 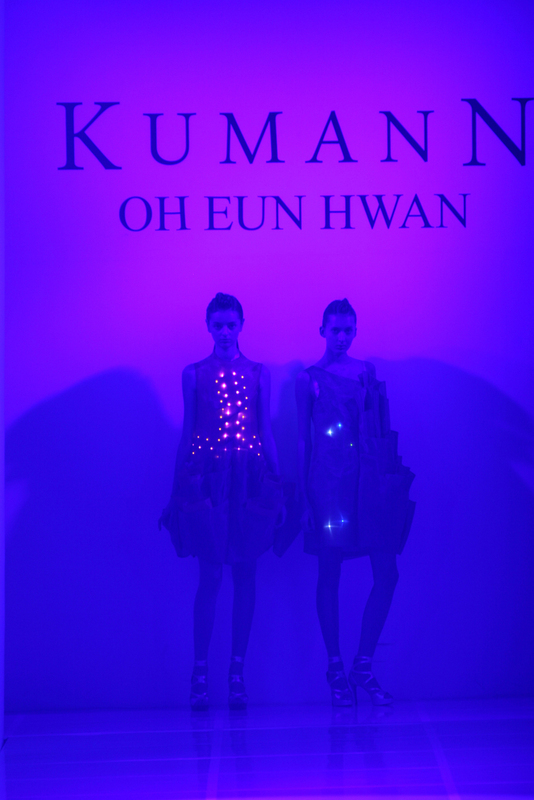 Kumann OH EUN HWAN pays attention to the novelty of 30’s modern look that encompasses long and lean lines of art-deco styles from 1920’s and square suits with padded shoulders and emphasis on waistlines directing towards the 1940’s, at the same time. 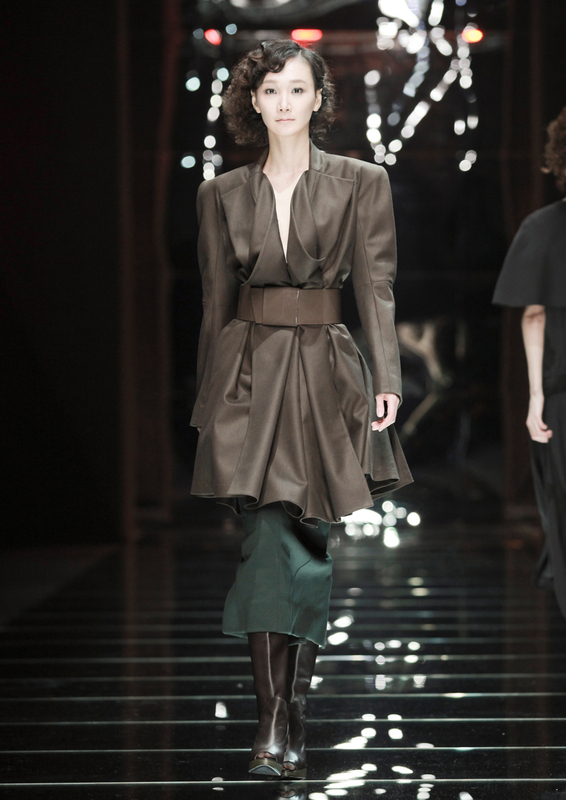 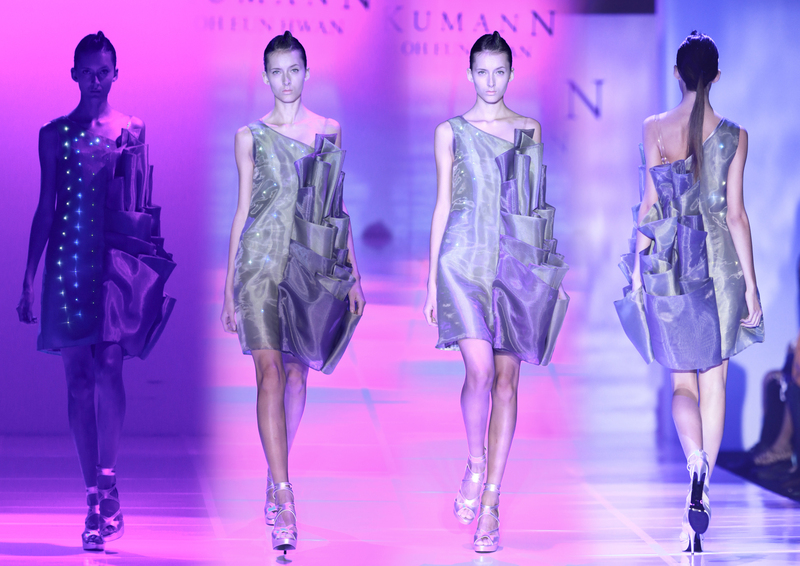 Kumann re-interprets those characteristics of 30’s, consisting of quite a different look which is mixed with art-deco inspired ankle-length blouses, long dresses, skirts, jump suits, basket weaved embellishments and tailored, boxy but slim-waisted long coats inspired from late 30’s. 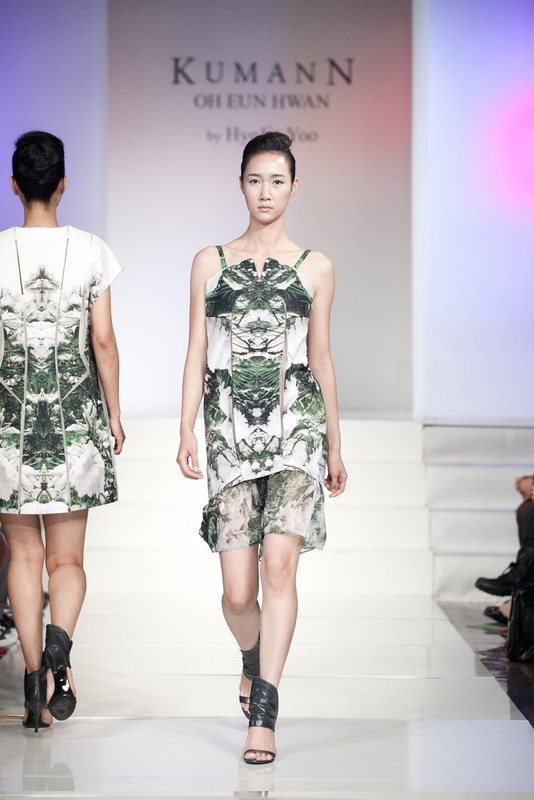 Draped dresses, bias cut, ruffles and more classical details are included. 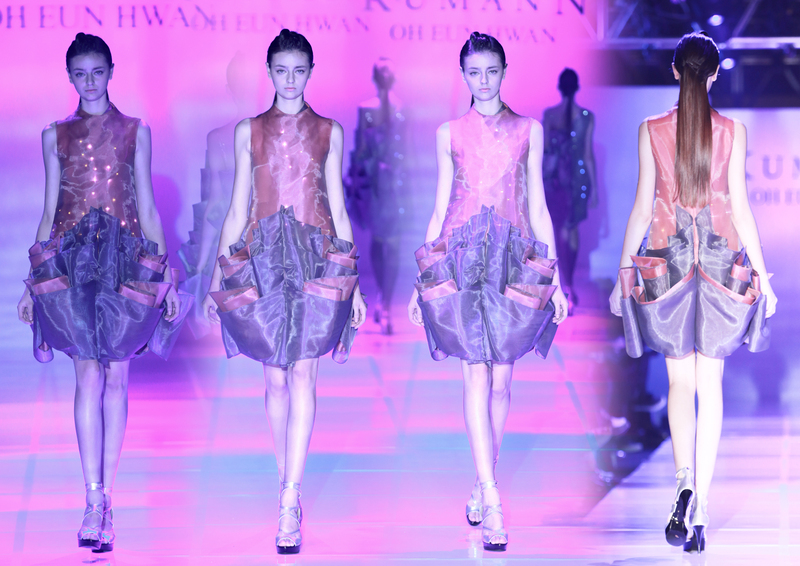 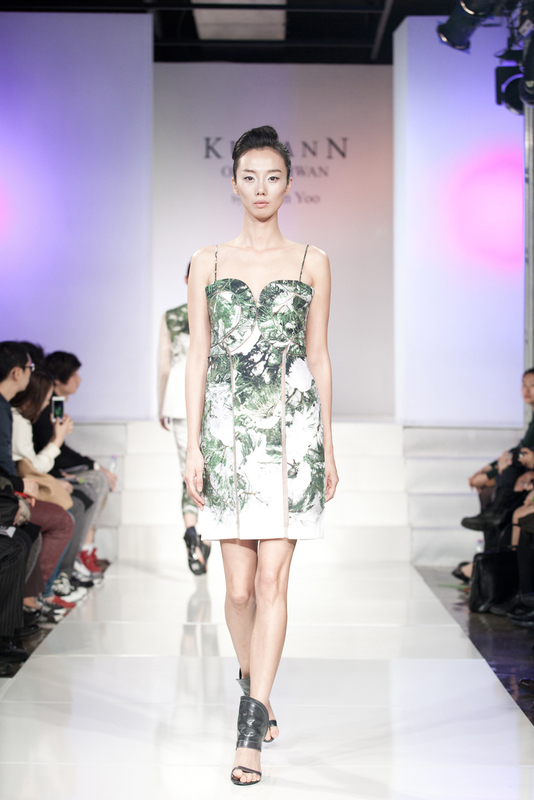 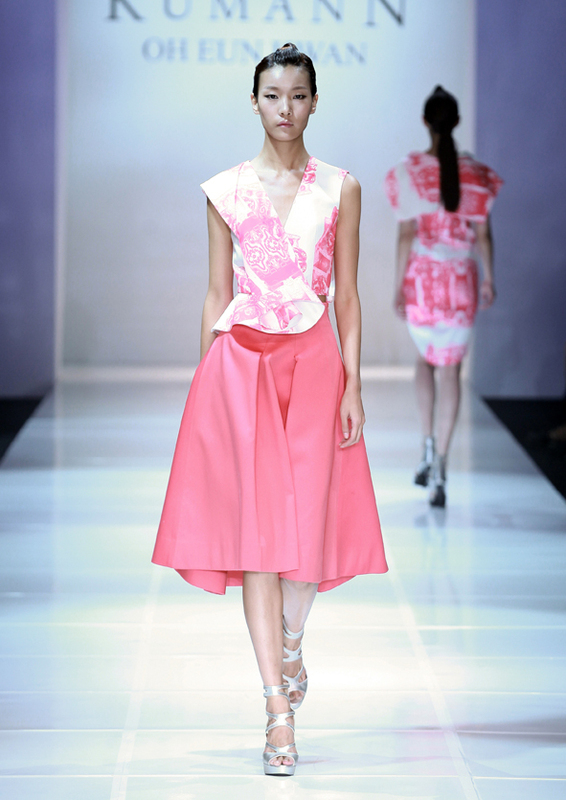 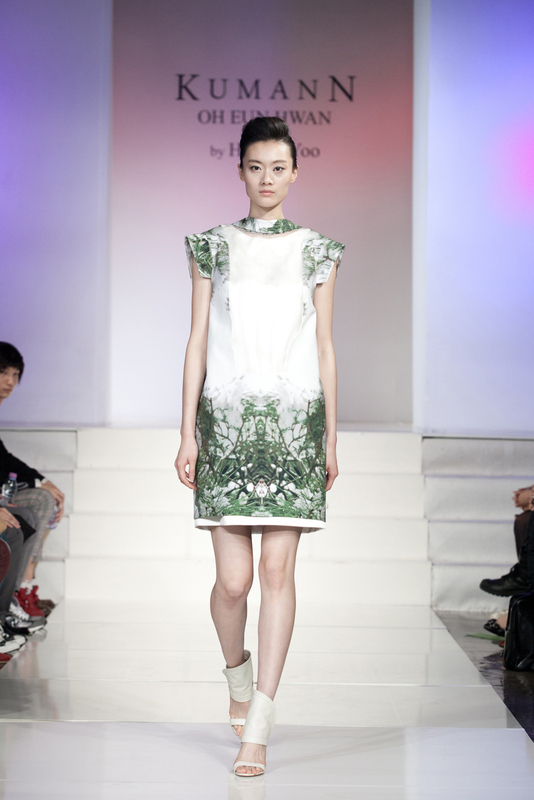 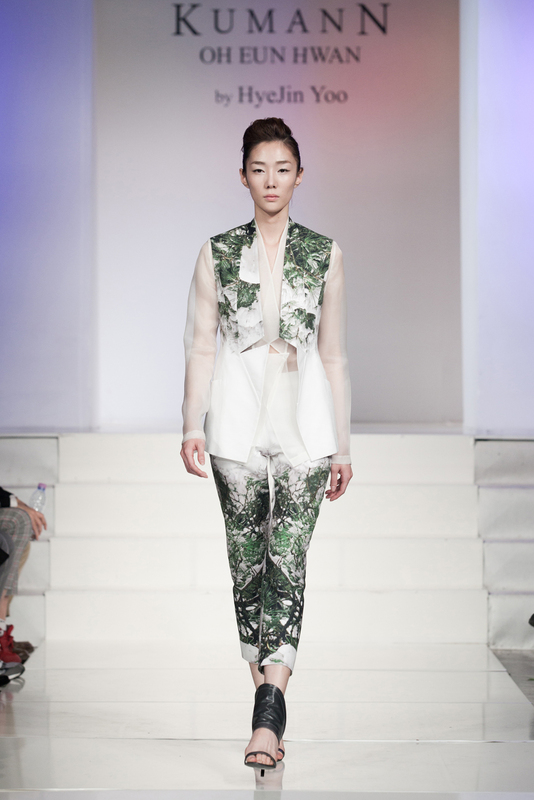 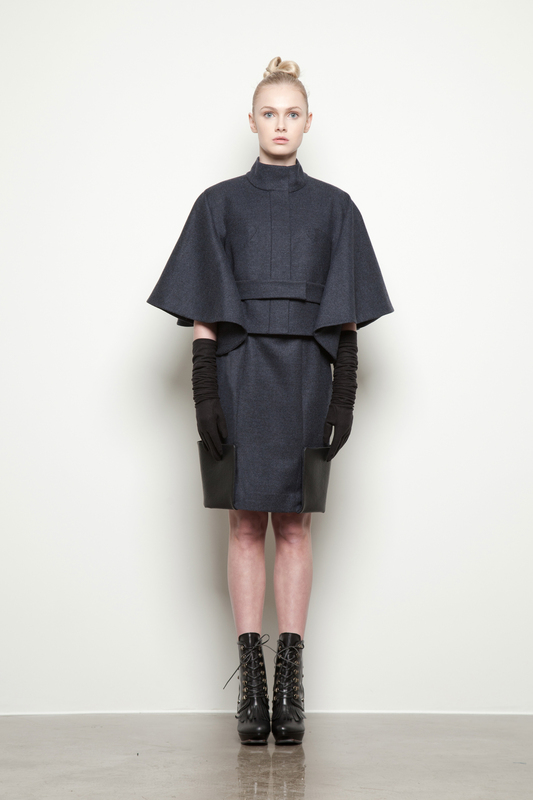 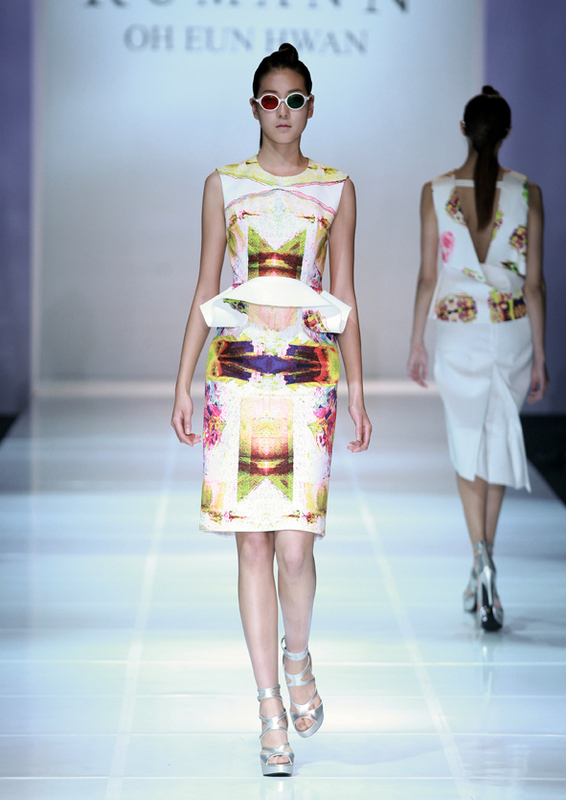 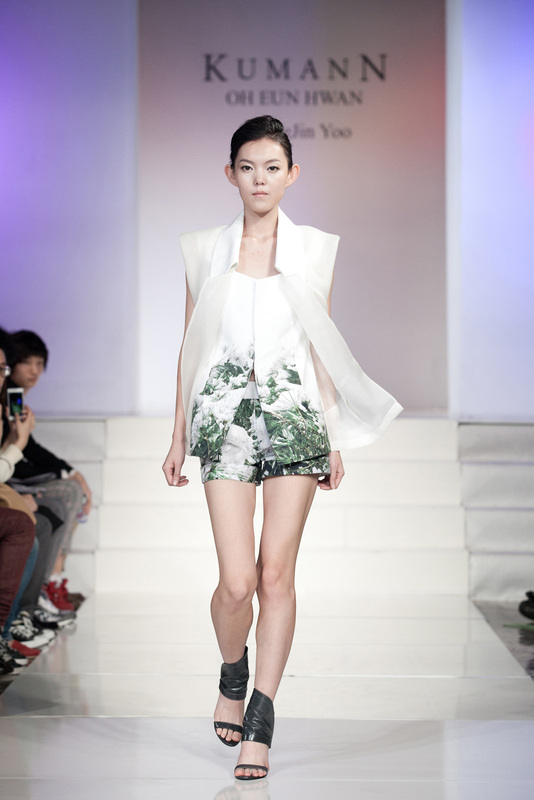 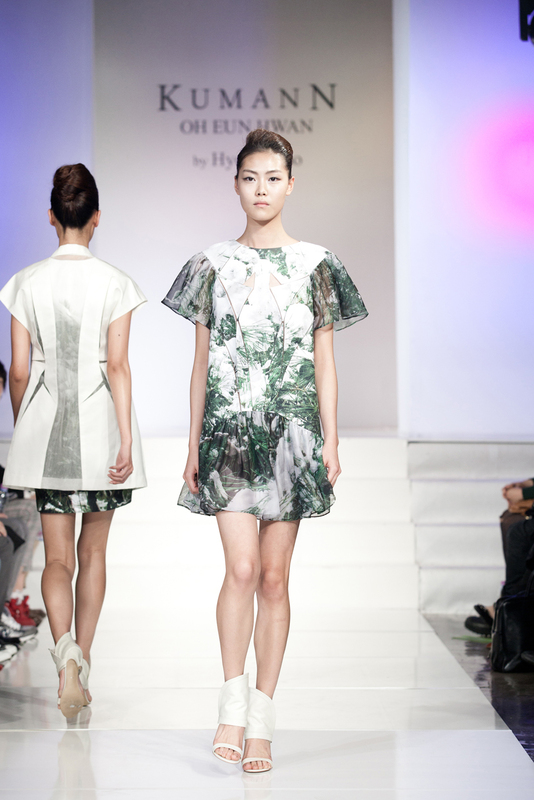 Kumann OH EUN HWAN’s spring/summer 2012 collection presents a message of ‘Artificial flora’. 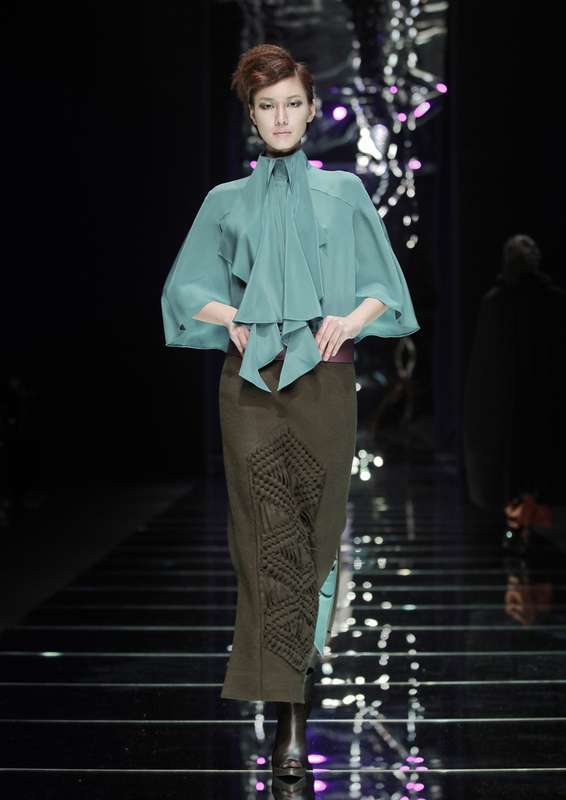 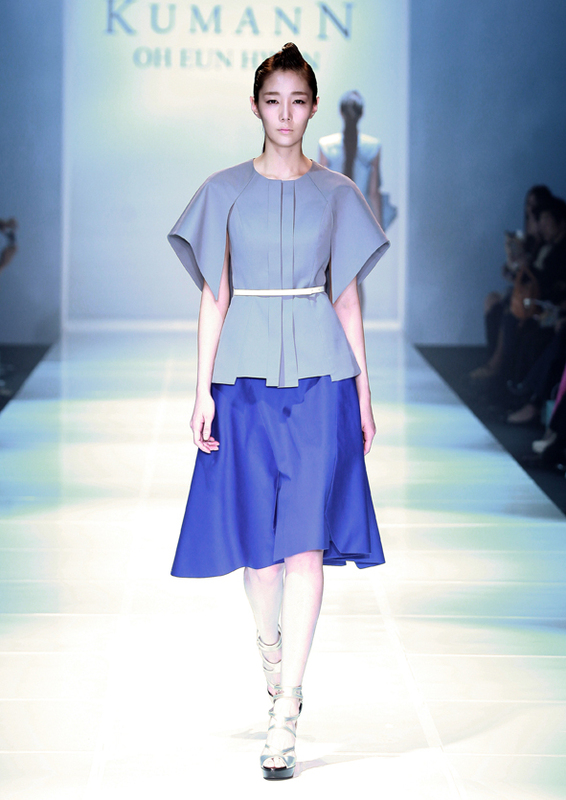 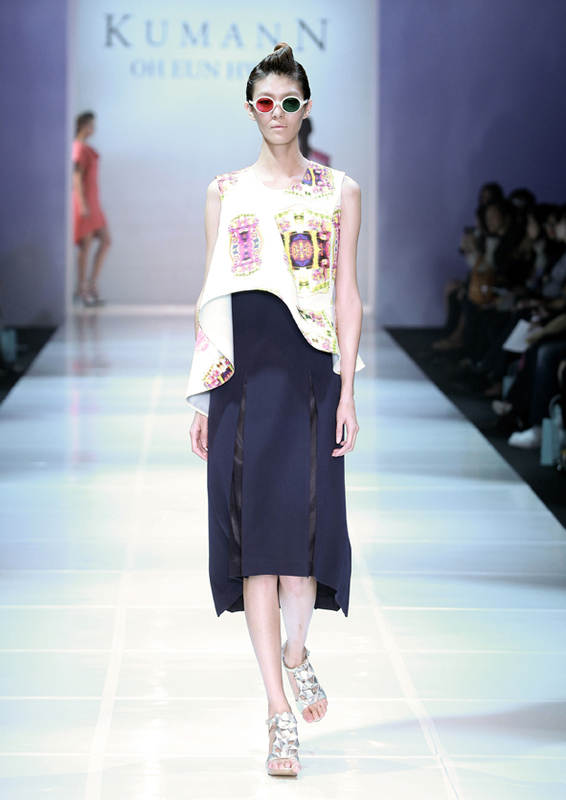 It comes with a type of appliqué craft in a series of geometric pieces with the refined silhouettes. 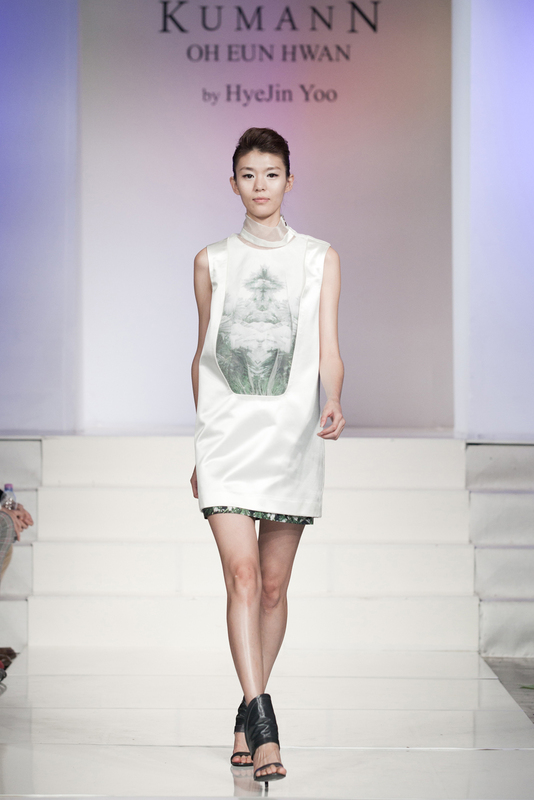 The concept is based on the response of apocalyptic phenomena that is represented with images of excessively manipulated and processed nature. 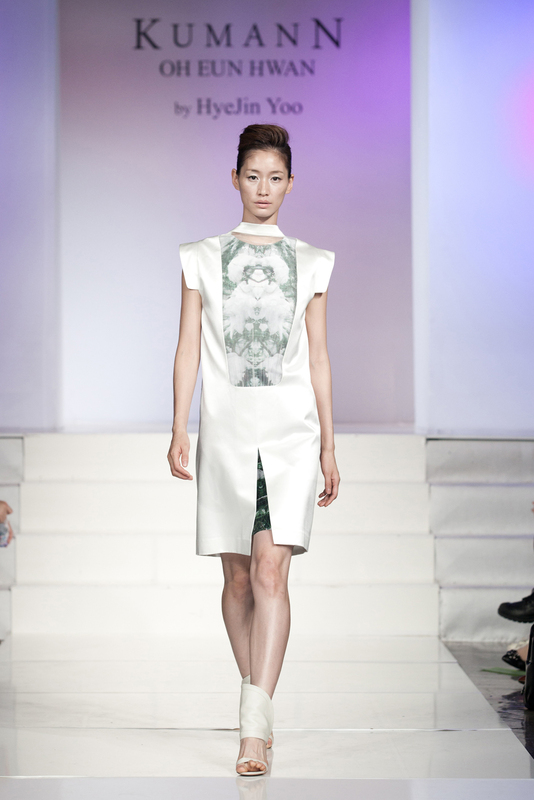 This season’s geometric compositions are constructed with see-through cut-outs on silk dresses, inspired by artificially manipulated natural images. 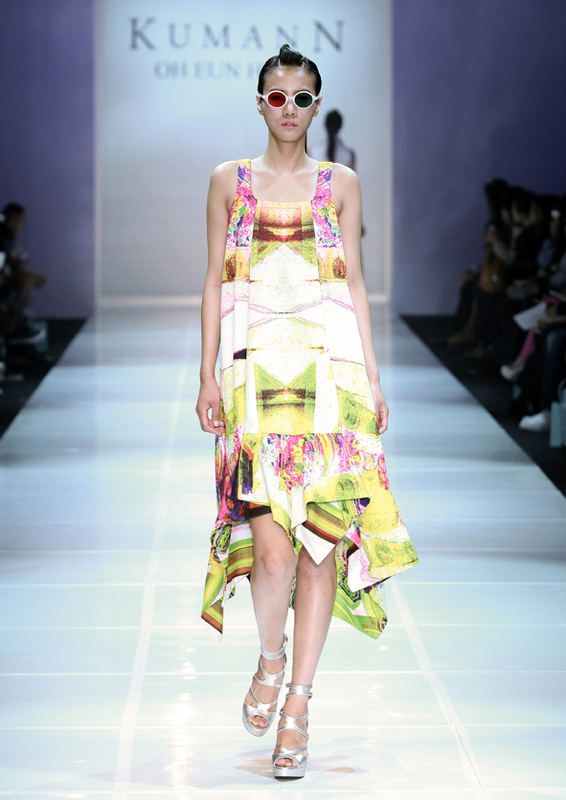 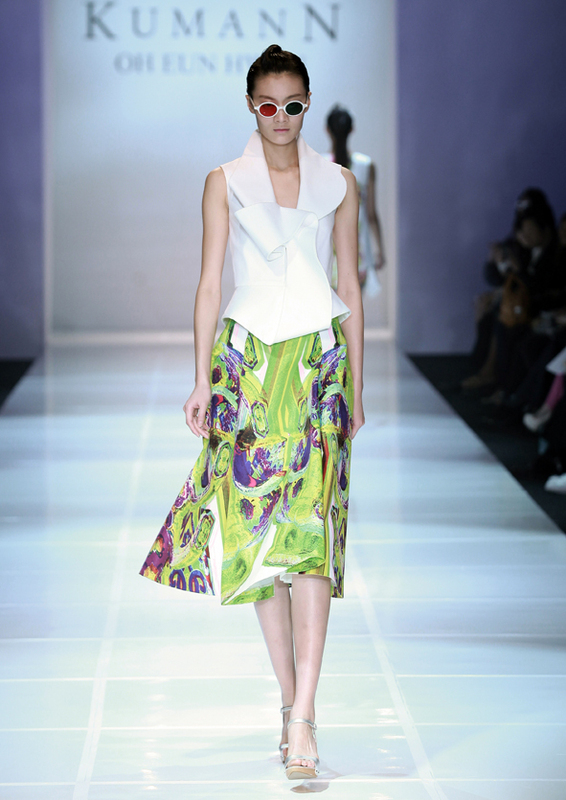 Printed dresses, and skirts go with silk vest, see-through chiffon vest and jackets. 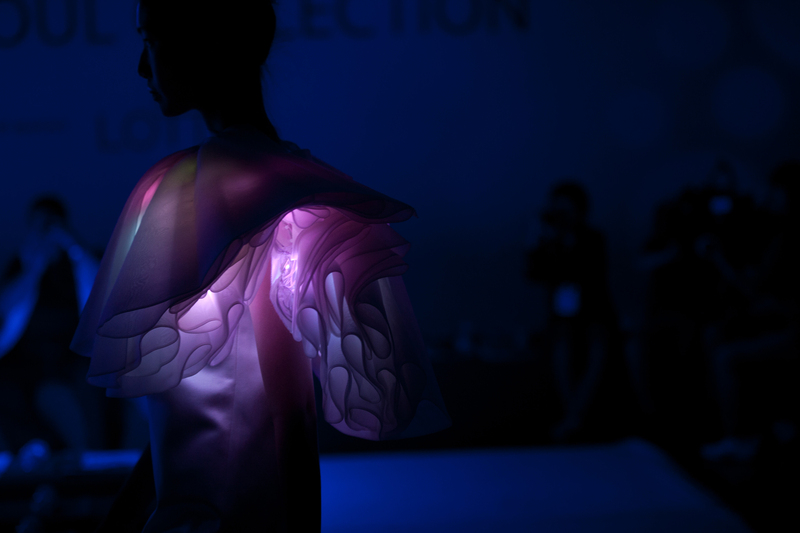 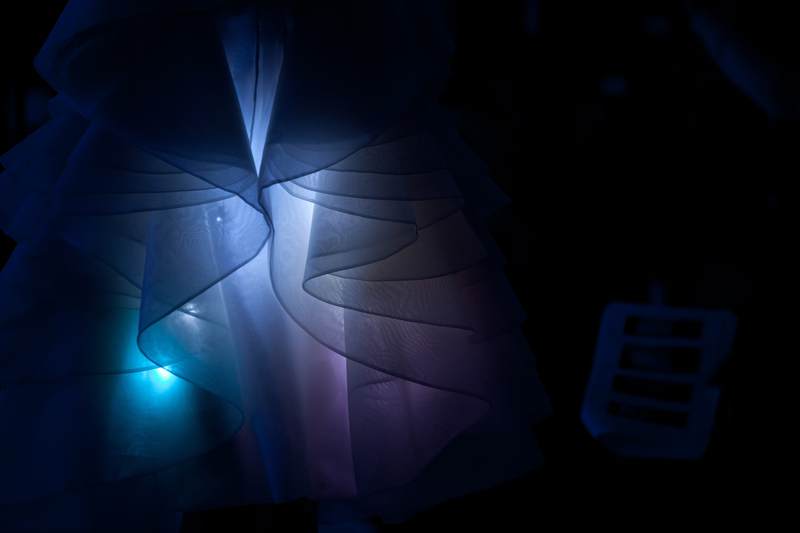 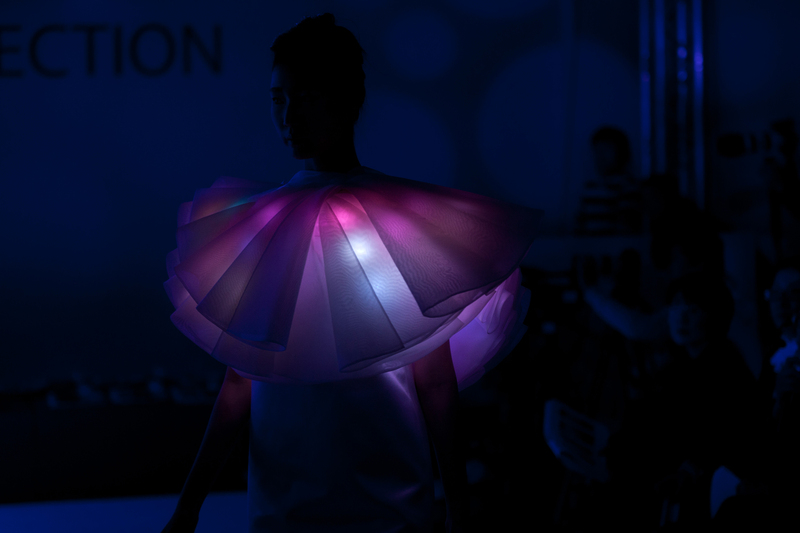 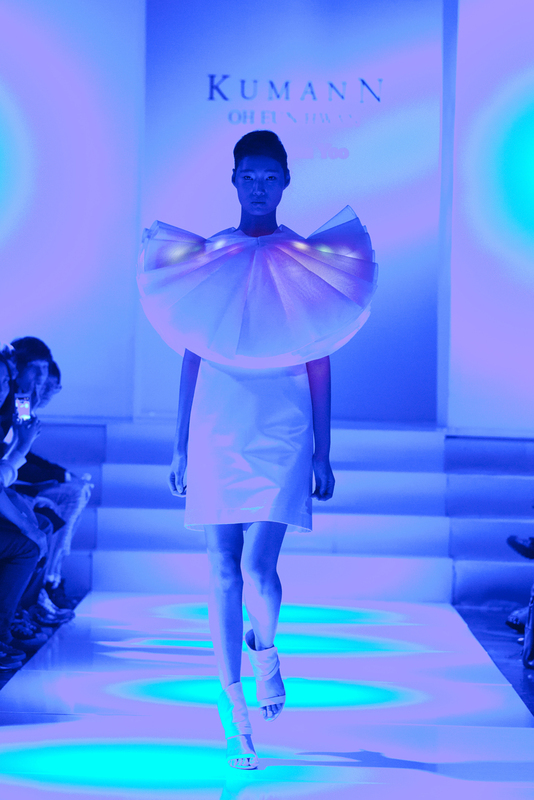 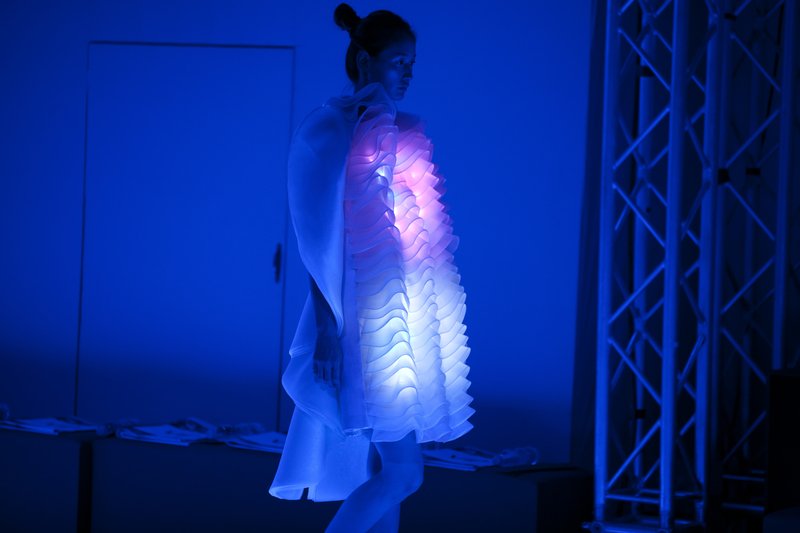 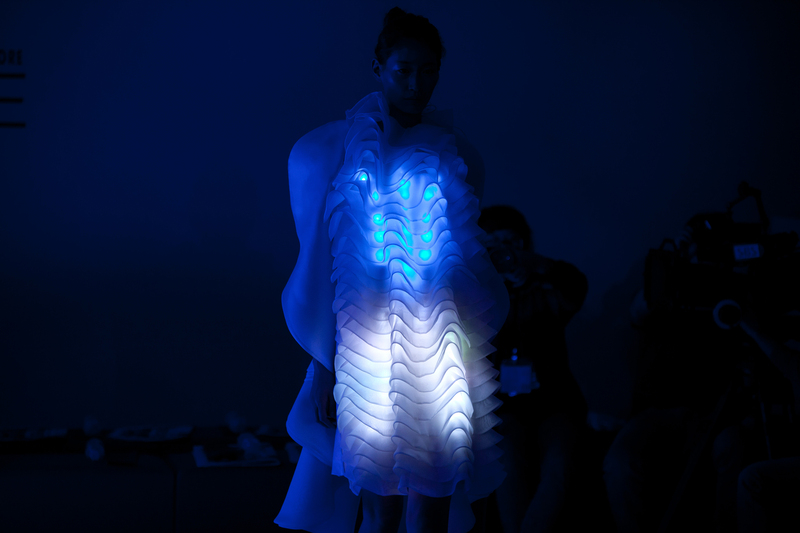 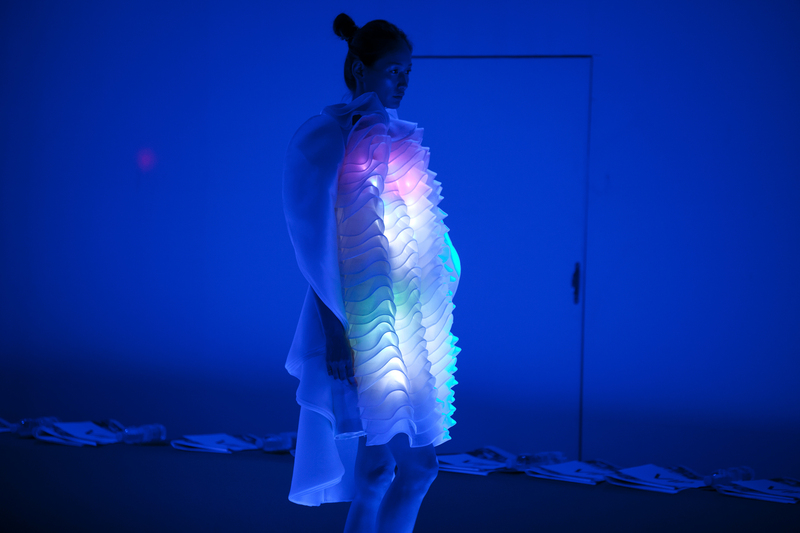 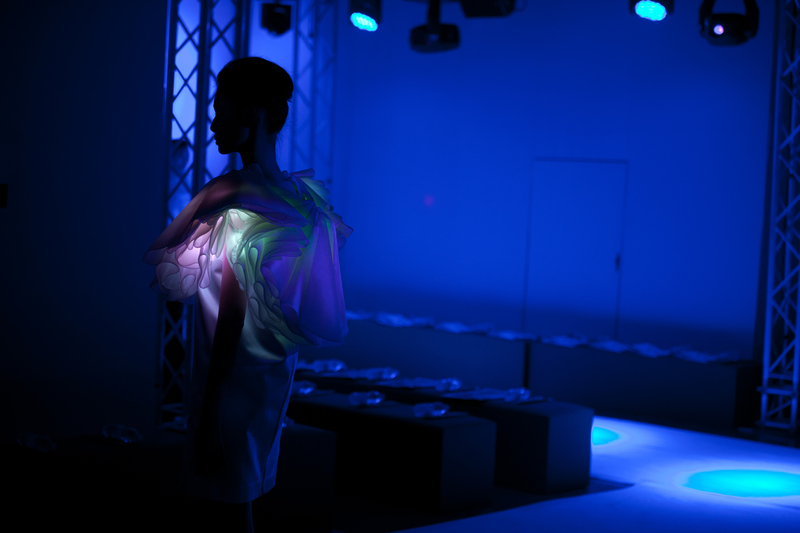 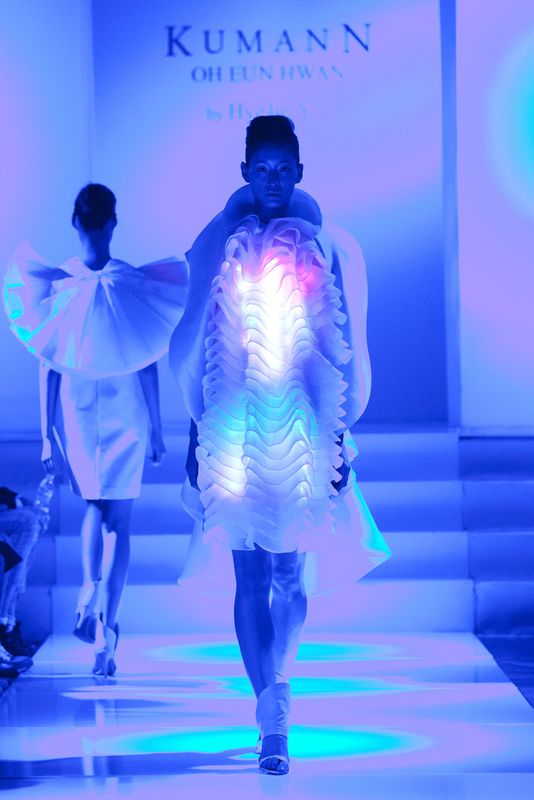 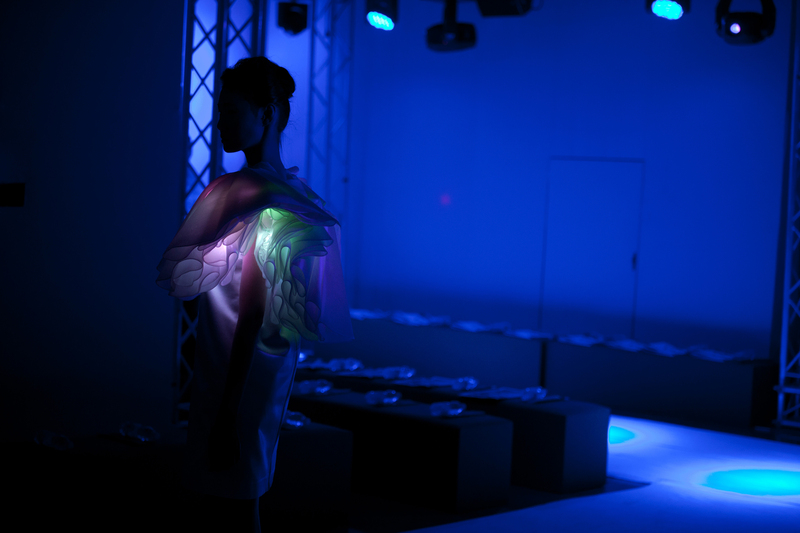 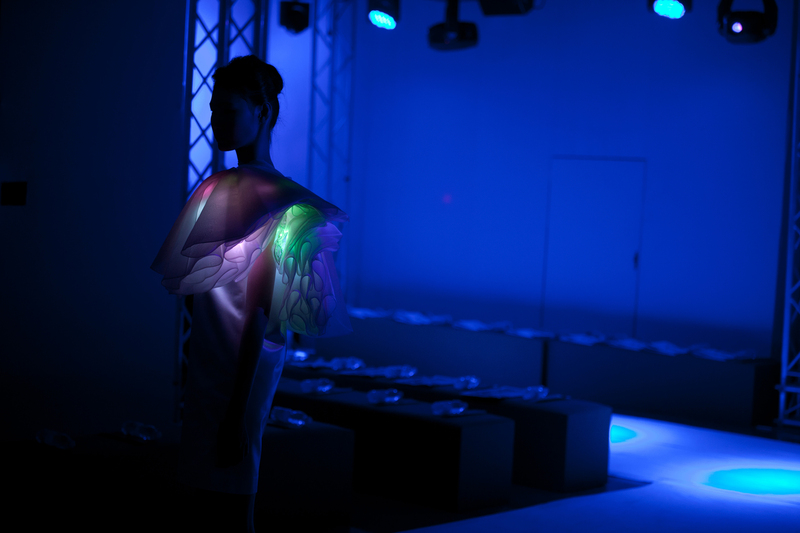 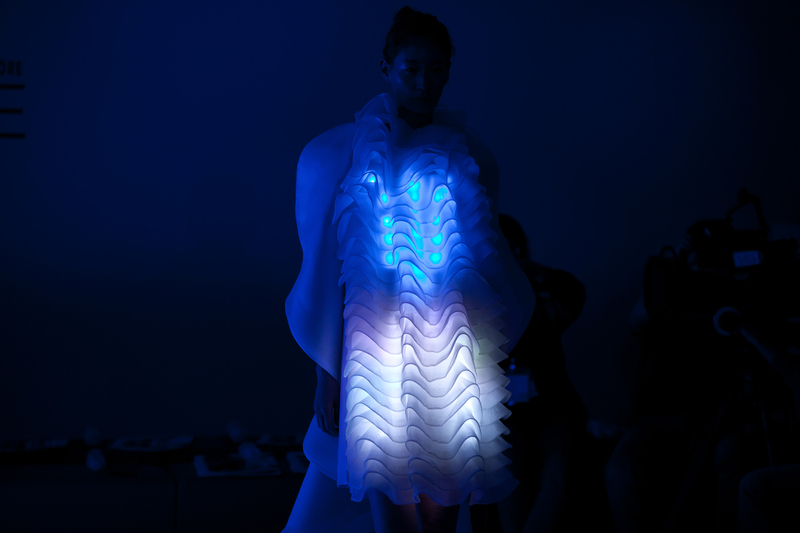 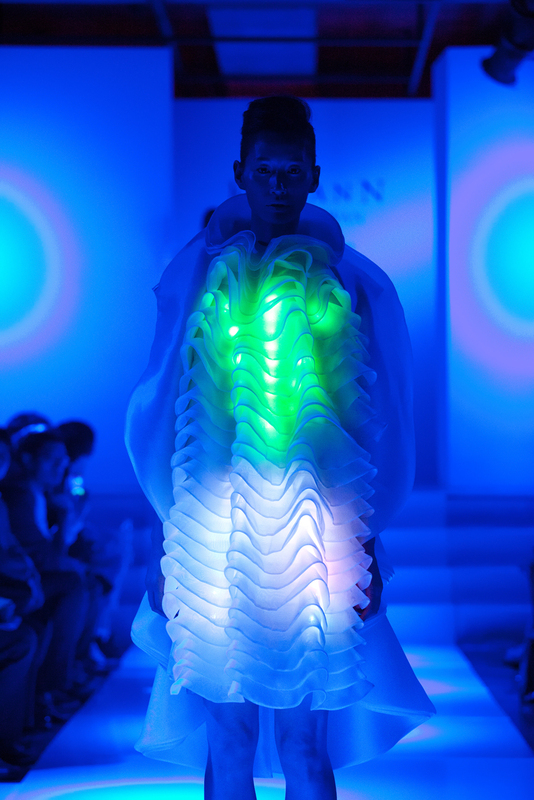 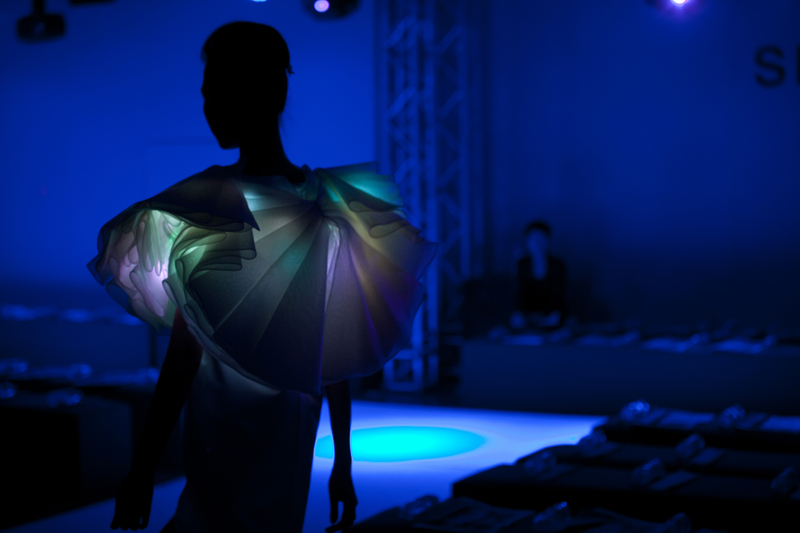 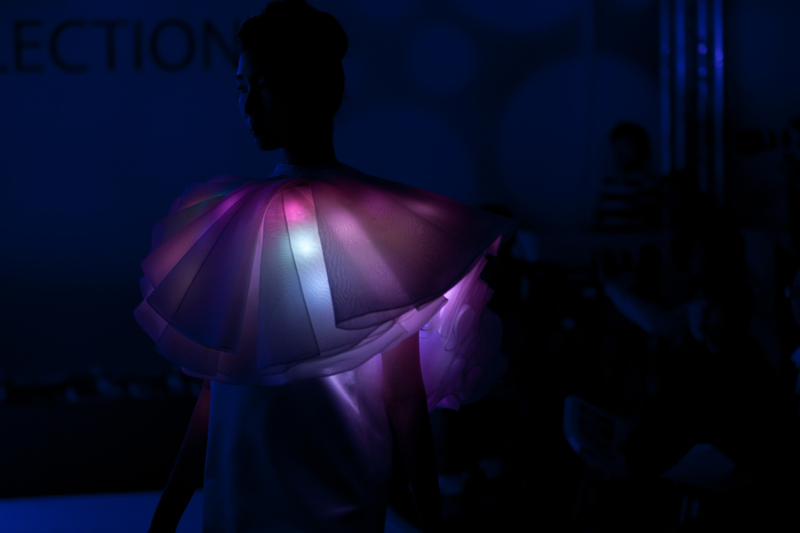 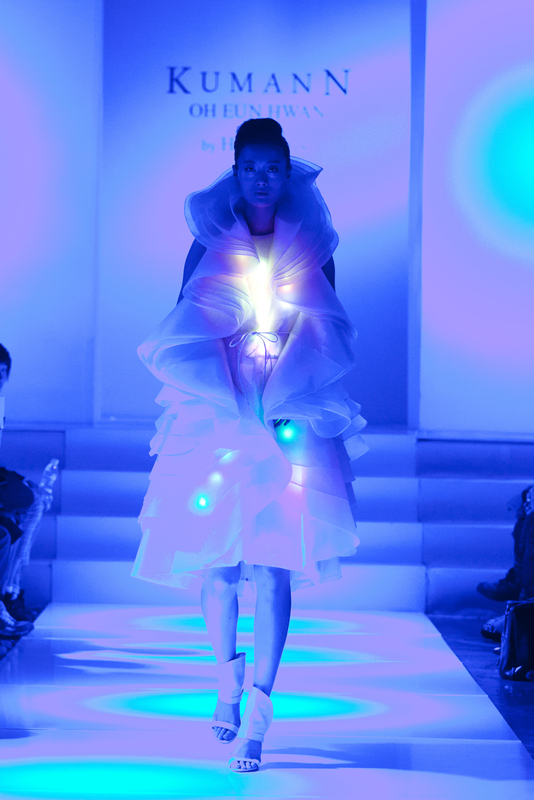 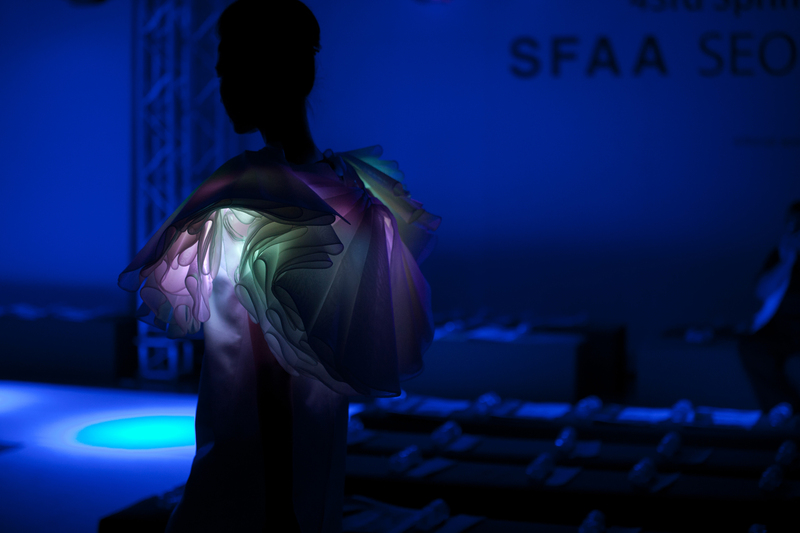 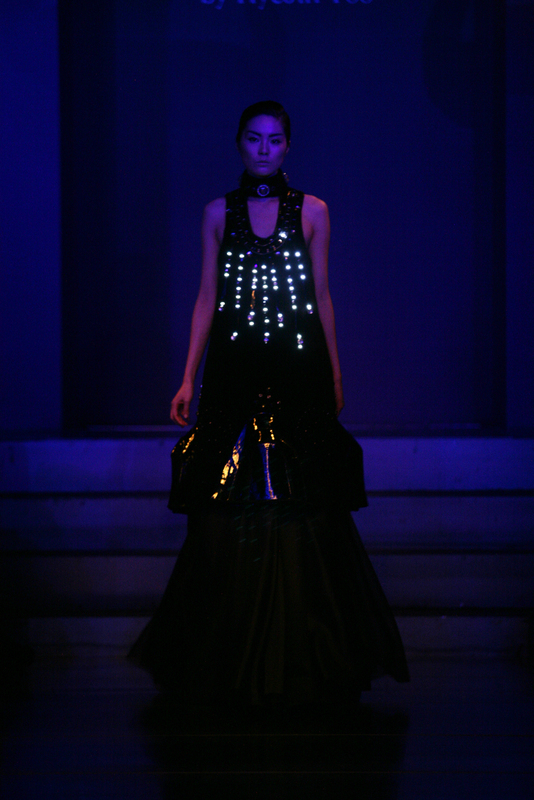 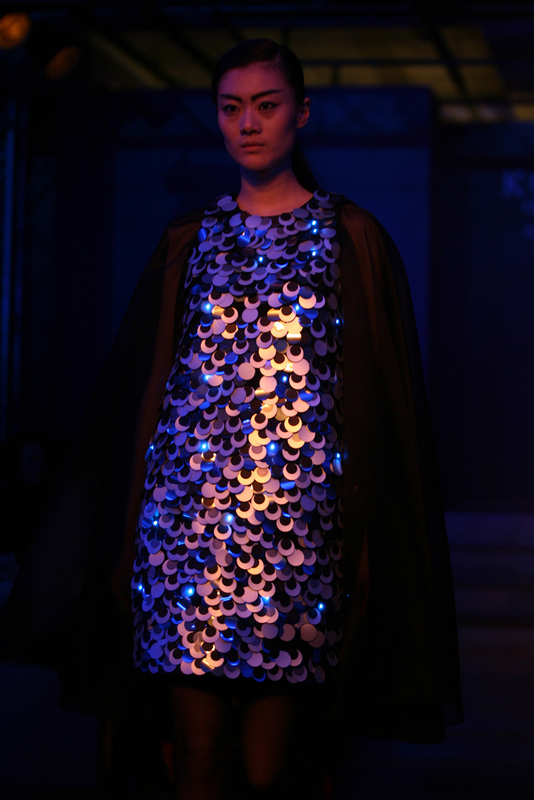 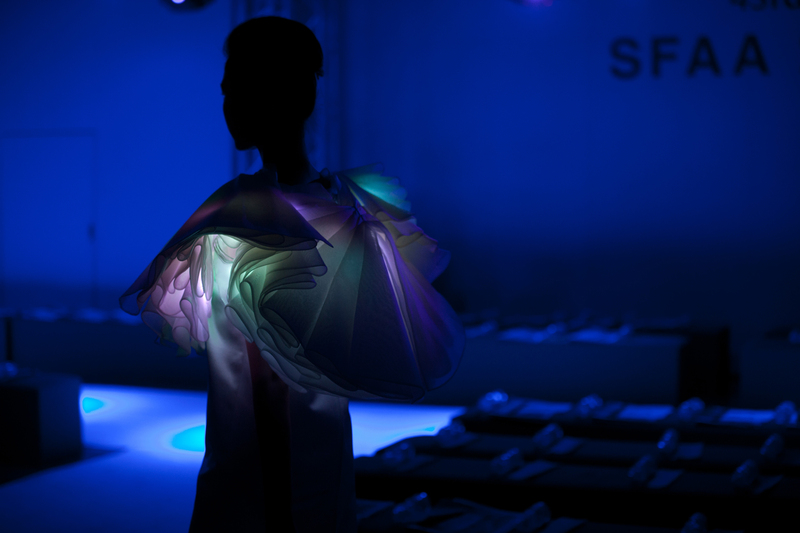 HyeJin Yoo also continues to explore designing an electronic wearable piece with color LEDs for this season.